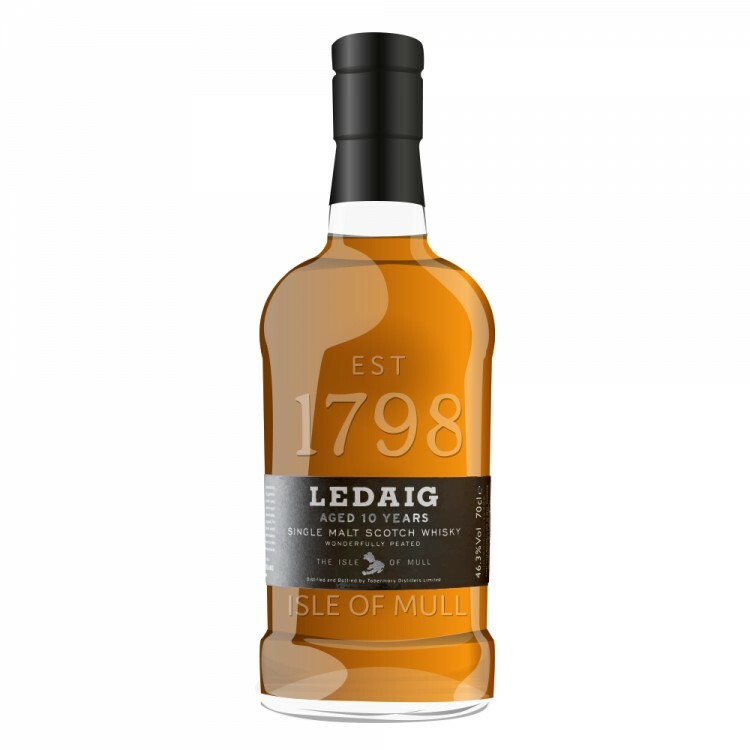 Ledaig single malt whisky is produced at Tobermory distillery on the Isle of Mull. Its name apparently comes from the original name for the region, Ledaig, that means 'safe haven' in Gaelic. The nose starts with very distinct 'farmy' flavours: porridge, cereal, malted barley - these are underpinned by light smoke, brine, as well as by a salty note. The nose then turns somewhat austere when notes of cardboard and wood shavings come to the fore, followed by a hint of lemons. The palate is fairly light-bodied and spicy. The lemon flavours are back, now together with oranges. The light smoke observed on the nose also reappears and continues to underpin all other flavours. The finish is of medium length, spicy, and dry. The light smoke from both the nose and palate has now turned to ashes. I am quite fond of the nose and the combination of farmy flavours with delicate smoke and not a hint of iodine. The palate however does not live up to the complexity of the nose and is definitely too thin for my taste. Good review! I really liked my bottle of this, so much so I will be cracking open a 6 year old Ledaig from Signatory next week. I remember it as being 'juicy' in the mouth as opposed to thin but that farmy note is spot on. An ever so slight whiff of 'spreading muck' on the fields; which sounds disgusting but gave it a very unique character. Was also surprised by the high peat levels and phenolic punch. Oh and that licorice note at the end . . . lovely! It's a pretty good example of a Speyside peater. A similar value (although a bit different in profile) to the Benriach 10 year old Curiositas. I might be a bit more generous and give it 84, but I think you nailed the flavour profile right on. 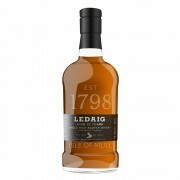 @RianC , what are the specs on that Signatory Ledaig you got cooking? Is it a sherry cask? 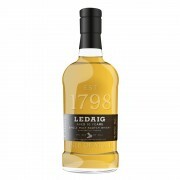 I know those young sherry-cask Ledaig IBs are lighting up certain corners of the whisky world lately, and I'm dying to try one. @MadSingleMalt You're right, it's an Islander. My boo boo. @BlueNote - I had the BR Curiositas earlier this year and wasn't overly impressed but it was decent value (£30) then . . . has crept up towards £40 very quickly. Not bad but would probably have been better at the old 46%. Tried the more sherried 18 recently and without the ability to taste side by side thought I preferred the 10. I could see a younger one working though. @RianC We are still getting a 46% version here (Vancouver). What is the ABV where you are? It's very popular here, I usually have a bottle on hand. @BlueNote @RianC I think BenRiach is a Speyside distillery, isn't it? @BlueNote - In the UK it's at 40%. Not uncommon either. Old Pulteney, HP 12 Balvenie, Laphroaig et al all get sent out at 43% where we get them at 40%. Bummer, Dude! @Robert99 - Yes it is. Did I miss something? Probably! I'm gonna have a couple of small nips then off to bed, tough few weeks. @Pierre_W Sorry, my bad. The reference was to the Ledaig. @RianC The previous comment was addressed to you. Sorry @Pierre_W . Maybe I should go to bed even if it is only 14:15 here. @RianC Serious bummer. You'd wonder why they would shortchange the domestic market which you would assume is there bread and butter consumer base. I can say with certainty that the extra 3% in Laph10 makes a noticeable difference. I have also had Glenmo 10 at 43% which improved it considerably. @Robert99 Nothing wrong with a short afternoon power nap.